How Does My Posture Look? What is often referred to as good posture, described as straight and erect, is actually the manifestation of a double S-shaped spinal curve when the spine is viewed from the side, as shown. These natural curves, along with the intervertebral discs, is ideal for evenly distributing weight bearing stress throughout. Unfortunately, this double S-shape has become more the exception than the rule, replaced by a posture of bending forward in a hunched over position. Instinctively, this is the position we go into when we’re suddenly frightened into defense. In this stressed position, the head is forward of the body. The forward and backward bending curves of the lower spine are equally important, congruent with our male or female anatomy and the range of how we experience, express, and move through life’s events. There are, of course, distortions involving lateral bending and rotational curvatures as well, referred to as scoliosis. 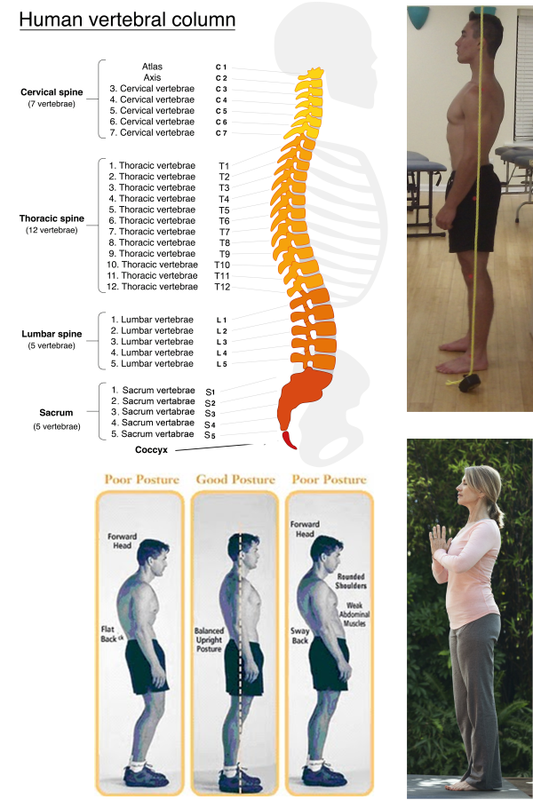 As we age, any departure from the healthy, weight-distributed and balanced, double S-shaped spinal curve in being our easiest, most accommodating position when standing or sitting upright, will severely strain the spinal muscles and joints, along with the functioning of the spinal cord in its important role of mediating communication between brain and body. This is completely preventable and significantly, if not totally, reversible. between the knee joint and knee cap. The knee should be almost straight. Not pulled completely straight, which hyperextends the knee joint. just in front of the outside ankle. 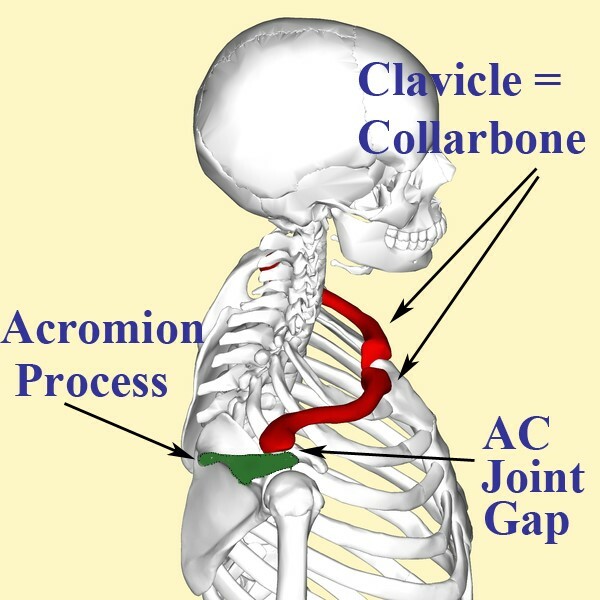 Acromioclavicular joint: About half way between the front and back of the shoulder, if you want to approximate. To be more precise, run your fingers along the inside surface of the collar bone (clavicle) until you reach the outer edge of the top surface of your shoulder, very close to where the bone of your upper arm, called the humerus – meets the shoulder socket (glenohumeral joint). 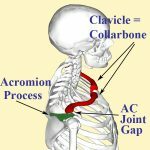 There you’ll find a very small gap, small enough that it’s easy to miss, between two bones – the clavicle and acromion process. You can feel this joint slightly moving as you move your upper arm. It should be in between the front and back of your shoulder. Greater trochanter: Run your hand up the side of your thigh, where you’ll feel the first round protuberance of your femur bone, a round but somewhat pointed knob. It will be a little higher up than your sit bones, almost as high as your pubic bone. You must be looking straight ahead – perpendicular to the view of the camera. All you need is a friend to take the picture, or something to rest your camera on, for shooting a video or a timed picture. Standing behind the plumb line, the anatomical landmarks listed above can be visibly marked, perhaps using small, sticky, circle labels. Every iota of improvement, especially in the position of the spine that you most easily hang out in when not even thinking about posture, will coincide with many improvements in different areas of your life.